Just north of town, the Moab Brand Trails (also known as the Bar M Trails) offer a huge network of singletrack and slickrock that has something for every type of rider. The Moab Brand trails encompass Bar M, Circle O, Rockin A, and Bar B. If you didn't notice the "brands" spell out M-O-A-B. Some of the trail names are Lazy-EZ, Deadman's Ridge, Killer B, Rusty Spur, Longbranch, and North 40. 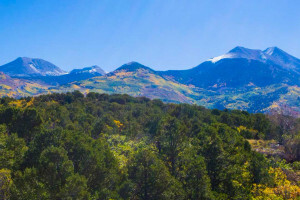 Beginner mountain bikers, or riders who just want to spin, will enjoy Bar M, Rusty Spur, and Lazy-EZ trails while expert riders will want to seek out Deadman's Ridge, Longbranch, and Killer B. The Bar M Loops trail is an intermediate ride and a great all-encompassing trail for the area. Start by heading right/counter clockwise on Lazy/EZ. It's an easy flowy trail until you hit the more difficult Deadman's Ridge. Test your skills on some technical sections. 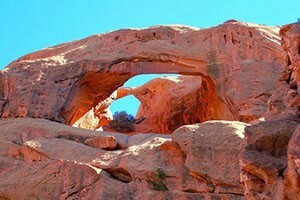 Either ride the entire Deadman's Loop or hit the cutoff for Rockin A to enjoy a bumby slickrock section. 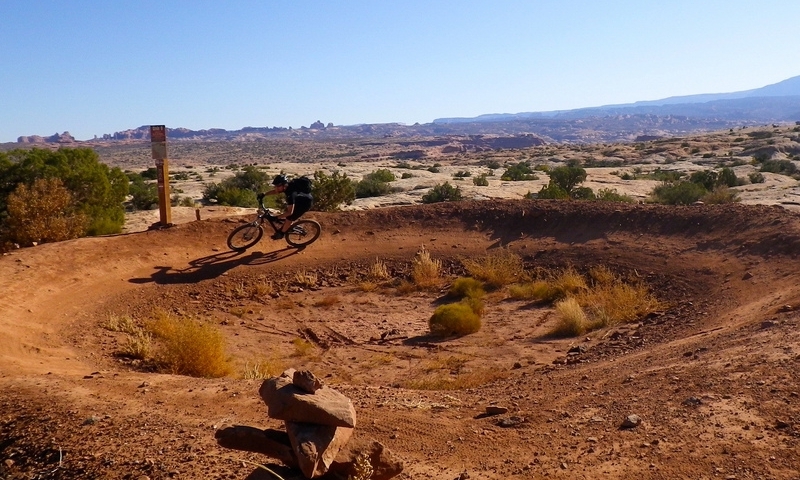 The Circle O entrance bowl is obvious (try riding it a few times) and then enter the proper trail for more slow going but fun slickrock and awesome views of Arches. Continue towards the North 40 Loop, a fun up and down singletrack trail, which will eventually take you back to the start. Distance: 1.5 miles to 15 miles! Trailhead: From Moab, drive north of town, about 7 miles from the Colorado River bridge. Opposite the Gemini Bridges parking area, you will see a sign for the Bar M Chuckwagon. Pass the chuckwagon and look for a large parking area with kiosk and bathrooms. When riding on slickrock, make sure to follow the painted lines to avoid crushing fragile soil and plant-life.